Do you know that there are some sicknesses that can be treated with flowers? Certain flowers offer healing because flowers they can lift the spirit and bring a positive mindset to an ill person. Which will surely help the regenerative process. But, flowers can also be consumed to health the body. Some flowers, after ingestion, can help you get well. And, there are particular flowers that, when applied to the body topically, promote healing. We’re going to tell you about some of these miracle flowers. We’re going to talk about a few flowers that you can use to get over the common cold, certain stomach conditions, and even respiratory issues. Calendula is an amazing healing flower because it can help reduce a variety of symptoms, inside and outside of the body. If you’re suffering from a cold or the flu, turn to calendula tea to help you kick it. 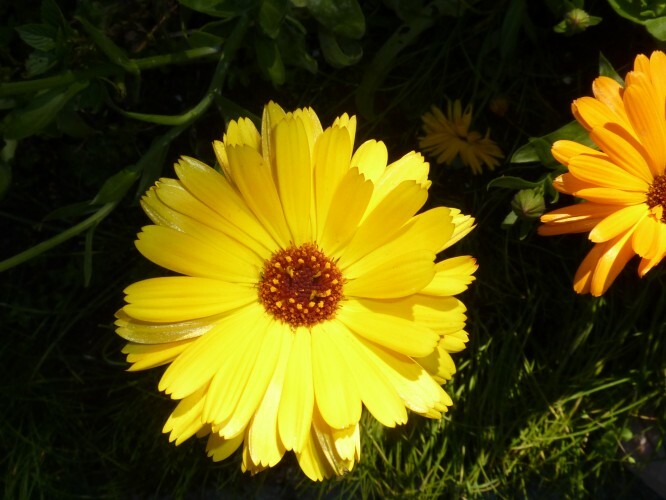 When you’re dealing with eczema or have other skin ailments, like cuts and burns, you can use calendula petals mixed with olive oil as a salve for healing. Angelica has many healing uses, but it’s often given to the elderly and to children as a system-strengthening tonic. Angelica can be used to treat the digestive system, coughs, colds, and more. It’s extremely fragrant, so consider making a tea with Angelica if you think a warm soothing drink before bedtime will pick up your spirits when you’re sick. Chinese medicine relies on gardenia for cleansing the blood, urine, and other internal fluids. Gardenia can help with physical injuries when its petals are applied in a carrier oil like coconut oil. This healing flower’s fragrance also works as a mental healing agent by helping to reduce depression, anxiety, and stress. Roses contain vitamin C, so feel free to make up a bit of rose water to drink when you’re trying to get rid of a cold or flu. Many people don’t know that roses are extremely safe for human consumption. Rose petal tonics can help mild cases of constipation and rose tea can assist with blood circulation. Creams and pastes made with rose petals offer amazing benefits to dry and cracked skin. We love flowers and we enjoy finding ways to bring them into our lives beyond just standard uses as tabletop arrangements. We hope that you will turn to some of these floral remedies if you find yourself feeling under the weather or hurt. Of course, we do recommend that you consult your physician before you consume these flowers. Do you know that there are some sicknesses that can be treated with flowers?Certain flowers offer healing because flowers they can lift the spirit and bring a positive mindset to an ill person. Which will surely help the regenerative process. But, flowers can also be consumed to health the body. Some flowers, after ingestion, can help you get well. And, there are particular flowers that, when applied to the body topically, promote healing.